Well, those pages were the only ones that I had completed. I had started on some others but had not finished them. Well, that changed today! I completed three more today and that just leaves the one for January 31st. I plan to get it done over the weekend. I'll share the pages I completed tonight. The challenge for January 10th was to use gesso. I had never used gesso before, so I had to order some from Amazon and wait for it to arrive to do this page, so that's when I fell behind. Anywho, I painted the pages with gesso and let them dry and then I used watercolor paints to complete the pages. 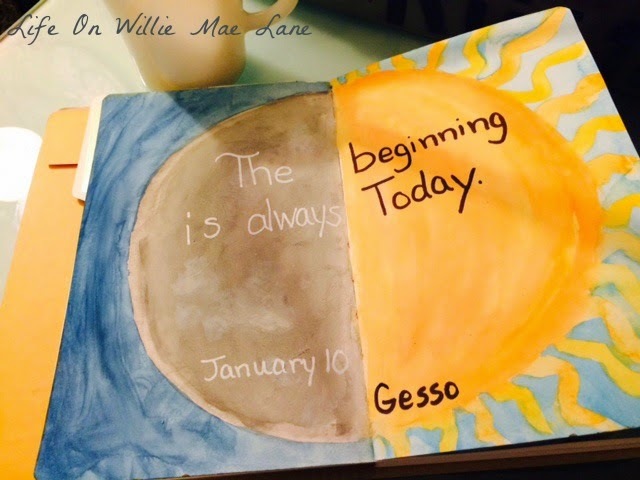 The journal prompt was the beginning is always today. I chose to represent this with a moon and sun. 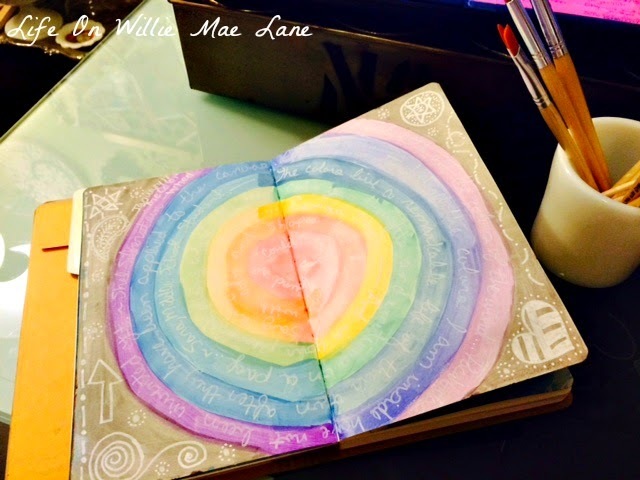 I chose to paint circles, changing colors as I went. I doodles shapes around the grey edges and wrote a few quotes with white a Sharpie paint marker around the circles. The January 24th challenge was writing and the prompt was words with friends. I found an inspiration picture online and used it as a guide. 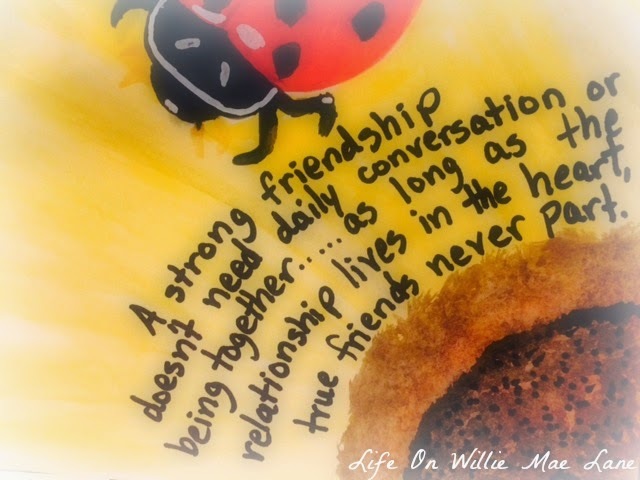 The ladybug holds significance for my best friends and I. Please ignore my goofy back legs....my ladybug looks more like a cricket! LOL! I found a saying I liked via Pinterest and went with it. I feel like words aren't always necessary with true friendship. Do you know what I mean? I am no artist, but I have had fun with these challenges. I am happy to be caught up and am hoping to get started on some embroidery this weekend as well. I haven't had a chance to use any of the supplies I ordered and I'm excited to get started. I hope each of you has a beautiful Friday. Vicky, all the pages are great. I really like the color wheel week a lot! I'm enjoying this very much and while I'm no artist either, its kind of freeing to just do it. I'm working on 1/31 week and will have it up by Sunday I hope. I really love both this project and the various ways that you have taken it. What a wonderful, creative thing to do! Art is also therapeutic, as I'm sure you know. Love it all...can't wait to see the other things you have done! Your art journal is so pretty and you did a great job with your painting. I do hope that you have a nice day and weekend too. Beautiful pages and I love the friendship quote. 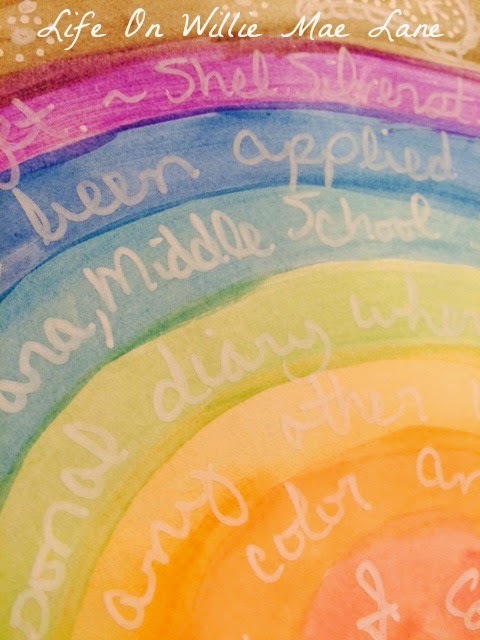 Your journal is beautiful and bright - just like you. Happy weekend, sweet friend. Hugs! Good Morning Vicky, Thank you for sharing your journal pages . . . they are absolutely wonderful :) You have a real talent for journaling and you are inspiring me to get mine out . . . I am ashamed to say how long it has been. All of your pages are beautiful, but my favorite is the January 17th. Dear Vicky, You must be having so much fun doing that journal! I bet it is hard to get everything all done every day! I have not worked full time in over 25 years. And I find some days I do not have enough energy to do it all! That is soooooo cute. I love your ladybug Vicky. Very artsy! I love seeing your art journal and think the idea of having a challenge is a good idea, it gives you something to think about....I'd need a starting point, can't wait to see more of yours. You are an artist! 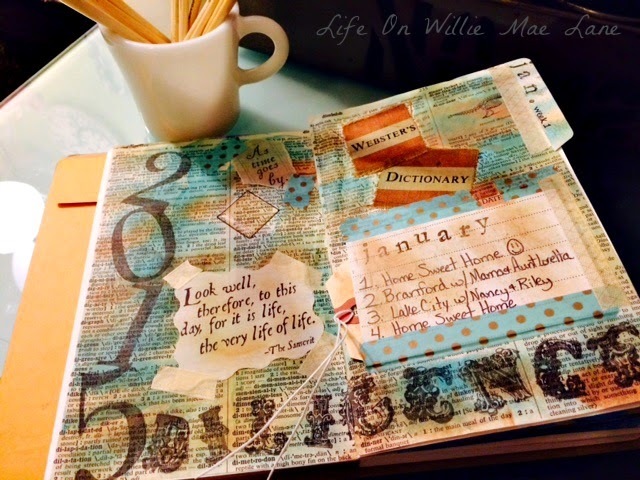 Your journal pages are simply beautiful. You make me want to get my journal out and start creating. Really pretty pages Vicky, and that friendship quote is so true. Your ladybug is adorable. Hey Vicky! I'm behind on reading my fav blogs so I'm playing catch up tonight. :) I love your journal! I just started one for memorizing Scriptures. It's fun and I hope by adding meaningful art, it will be easier to memorize. :) I like the ladybug...wondering what the significance is. 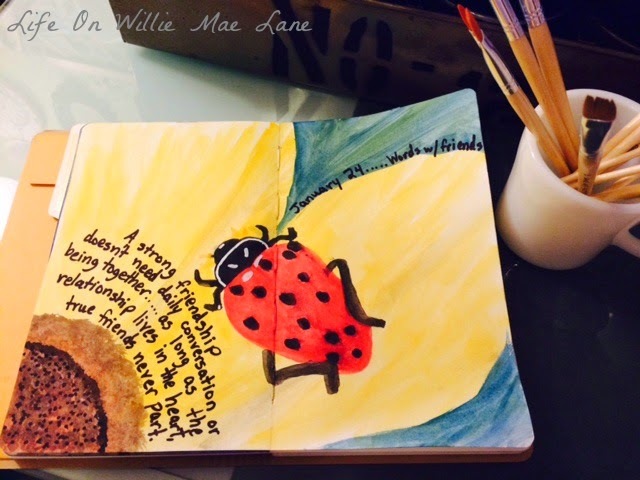 One of our Ladies Retreats was on "Ladies Better Understanding God" thus lady bug. Anyway, way to go on keeping up with stuff! Have a wonderful rest of the week! You've done a great job and the quotes are well chosen. It's so difficult not to fall behind with our projects. Oh wow! You are so busy! I hope you sit on the couch and put your feet up once in awhile! Love your art pages....very creative! An Art journal... huh what a cute idea! I'm not a very good art person, but this might be kinda fun to get creative with. 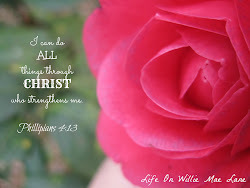 I do a bible study that you have a lot of drawing and coloring to do and that has been fun and very inspiring. Plus, when I get bold in my bible, it seems to stand out more. The scriptures just seem to pop right off the page! I hope you have a wonderful day and a lovely Valentine's Day too! Oh, your journal is looking so pretty Vicky! I've worked with Gesso before, it's kind of cool. The whole thing is beautiful including your lady cricket bug! lol!